In this Dec. 22, 2018 file photo, the Capitol is seen on the first morning of a partial government shutdown in Washington. 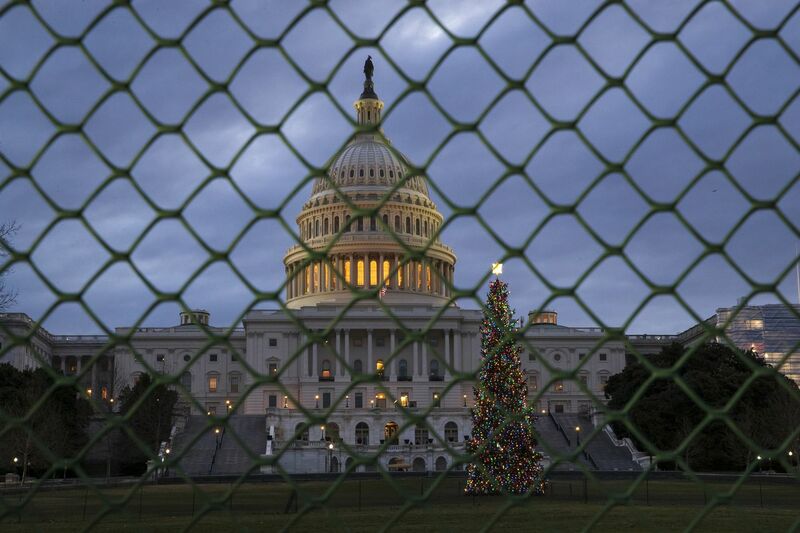 WASHINGTON - While many federal workers go without pay and the government is partially shut down, hundreds of senior Trump political appointees are poised to receive annual raises of about $10,000 a year. The raises appear to be an intended consequence of the shutdown: When lawmakers failed to pass bills on Dec. 21 to fund multiple federal agencies, they allowed an existing pay freeze to lapse. Congress enacted a law capping pay for top federal executives in 2013 and renewed it each year. The raises will occur because that cap will expire without legislative action by Saturday, allowing raises that have accumulated over those years but never took effect to kick in, starting with paychecks issued next week. Pence's pay is scheduled to rise from $230,700 to $243,500. There was no immediate comment Friday by the White House. The government payroll system has yet to implement the pay raise for executives including the vice president, a Congressional aide said. But given the hardships that budget impasse imposes on the rest of the country, "the optics of this are not pretty," said Jeffrey Neal, a former personnel executive at the Department of Homeland Security and now a senior vice president at ICF. Some 800,000 federal employees, out of a workforce of 2.1 million, are in unpaid status due to the partial government shutdown that began last month. Of those, about 380,000 have been furloughed. Many others are working without pay, and just before the New Year, President Donald Trump ordered a pay freeze for most federal workers, working or not. "I suspect the president isn't aware of the disparity - that political appointees will get a pay raise and no one else will," said John Palguta, former career executive in the federal government for human resources. "It's going to be seen as terribly unfair." The government's Office of Personnel Management did not return a request for comment. The pay freeze's expiration was discussed at length during a conference call Monday with officials at the Office of Management and Budget and the the Office of Personnel Management, who are meeting regularly to discuss issues caused by the shutdown. Some officials on the conference call, which included acting OPM director Margaret Weichert, were worried about the public perception of the raises and discussed how to respond to questions about them, according to one participant, who requested anonymity to talk about internal discussions. "It was definitely a 'this is not going to look good' situation,' " the participant said. The raises would cost taxpayers $300 million over ten years, according to the Senior Executives Association, which represents the government's approximately 7,000 highest-paid career officials. The group's executive director, Jason Briefel, called the freeze a "politically driven policy that over time makes it harder to bring good folks to government" and said that extending it is detrimental to hiring top talent. But he acknowledged that lifting it now "is definitely a slap in the face" to the rest of the federal workforce. "At a time when more than 800,000 federal employees aren't getting paid, it is absolutely outrageous that the Trump administration would even consider taking advantage of the shutdown to dole out huge raises to the vice president and its political appointees," Rep. Nita Lowey, D-N.Y., the new chairwoman of the House Appropriations Committee, said in an email. "It is wonderful that the president has decided to lift the pay freeze for top executives and his political appointees: They deserve a pay adjustment, as do all the people who work under them," J. David Cox, national president of the American Federation of Government Employees, which represents 750,000 federal workers, said in an email. "Leadership is about the principle that 'officers eat last.' The administration should make sure that the rank and file receive a pay adjustment before their bosses do." The mechanics of getting the raises into appointees' paychecks also is complicated by the shutdown, federal personnel experts said. The adjustments must be processed by each agency's human resources department, which depending on the agency, may not be staffed during the lapse. So some executives could see fatter paychecks starting next week while others would have to wait until the government fully reopens. The Democrat-led House included a continuation of the executive pay freeze in a bill the chamber passed late Thursday to reopen parts of the government without the funding for a border wall Trump wants. But that legislation is said to be dead on arrival in the Senate, where Majority Leader Mitch McConnell, R-Ky., says he will not vote on a bill the president won't sign. "For a thing like this to happen, I don't believe in coincidences," said Randy Erwin, president of the National Federation of Federal Employees. "It certainly smells fishy, just as the federal workforce is being furloughed." "It looks like Trump has protected his own appointees and everyone else gets screwed," Rep. Don Beyer, D-Va., whose suburban Washington district has 77,000 federal workers, said. He suggested that the president fix the problem by immediately issuing an executive order cancelling the raises. The pay freeze, passed by a Republican Congress in the recession during the Obama administration, has been an issue of dispute between Republicans and Democrats. Amid an outcry from Democrats and federal employee unions in the fall after Trump offered no raise to rank-and-file civil servants for 2019, Republicans wanted to scrap the executive pay raise as a condition of agreeing to a 1.9 percent raise for civil servants. But those negotiations got stuck in a conference committee before the shutdown.